Many of you have been in touch asking about the new website and, more specifically, when everything will be fully up and running again. Although the original site wasn’t large and didn’t contain a massive amount of information, it will still take some time to get everything put back where it should be and to ensure everything is working as it should do. Exactly how long that will be is uncertain, but we’ll continue to post regular updates as we add more material to the site. The forums will be the last thing to be rebooted due to a number of (cough!) “technical difficulties”. Yes, we are looking at you, Gruffty the Hiver. Today we’ve tidied up the menu structure and added the About Spica Publishing, Art Submissions and Contact Spica Publishing pages. 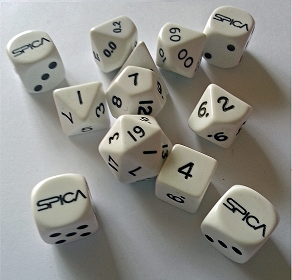 The Art Submissions page has the late Bryan Gibson’s lovely drawing of an Inanye from Field Manual and we added the artsy picture of some Spica Publishing d6 dice with a set of white polyhedral dice shown on this page to the About Spica Publishing page. I can assure you that it was all done in the best possible taste, ma’am. So, once again, thanks for your emails and for your patience whilst we put the jigsaw back together.